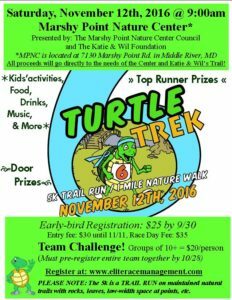 The Turtle Trek was started in 2011 to support the creation and development of a new trail at Marshy Point Nature Center in memory of mother, Katie, and son, Wil, who tragically lost their lives in a car accident in 2008. In 2013, the trail was constructed and 300+ acres that was once inaccessible has become a major part of the Nature Center. Once deemed “The Bridge to Nowhere” has now become “The Bridge to Anywhere” and is where you can find Katie & Wil’s Trail. Last year, Marshy Point Nature Center Council and Katie & Wil’s Foundation joined together to make this event an incredible opportunity to spend time with family & friends. All of the proceeds will go to Marshy Point Nature Center for needs throughout the Center; as well as the maintenance of Katie & Wil’s Trail. The course this year for our “Turtle Pace” participants (1 mile) will again take place on Katie and Wil’s Trail and the challenging Trail Run (5k) will continue with the off-road route. This is the complete 5k course and will make you think about more than just running! It takes place on the natural, remote trails throughout the Nature Center with very minimal paving. Watch out for the tree roots and foot placement; and, you never know when you might come across a fallen tree branch along the way. We do clear all the trails of branches, etc. ; but, hey – it’s nature, it keeps you on your toes! Awards for best times (managed by Elite Race Management) of the 5k run will be given for various age groups. There will also be plenty of door prizes, free goodies and lots of fun other things too. And don’t forget: The Team Challenge is back again, but you must register your team by 10/31/16. And of course, don’t miss out on Early Bird Registration!